Soon, being a paralegal will be a state-certified profession. Therefore, it is inevitable that the distinction between a legal assistant and paralegal will become more clear with the emergence of “the paralegal of the future”—the limited legal document preparers (LLDPs) and limited license legal technicians (LLLTs)—already certified by many U.S. states. For state-certified paralegals, LLLPs, and LLLTs, the difference is very clear in that these paralegals, by law, and like an attorney, must be educated, certified with continuing education requirements, licensed by the state, and insured. On April 19, 2017, the Supreme Court of South Carolina signed an order to include the NALS Professional Paralegal (PP) examination as an accepted examination for application to the South Carolina Certification Board for Paralegals. In January 2016, Honorable Costa M. Pliecones ordered that a Board of Paralegal Certifications be assembled and he nominated five attorneys and four paralegals to serve staggered terms for one and two years. Karen M. Cummins, M.P.S., PP, PLS, was instrumental in serving on this inaugural Board and the only paralegal serving on the Board for three years. Originally, NALS paralegal examinations were not a part of the criteria to be certified as a paralegal in the state of South Carolina. Although the ABA recognizes many paralegal training courses, NALS, NALA, and NFPA have the only recognized paralegal certification examinations given outside of the classroom. Ms. Cummins worked tirelessly for the past few years to demonstrate to the Certification Board that NALS belonged there alongside NALA and NFPA. 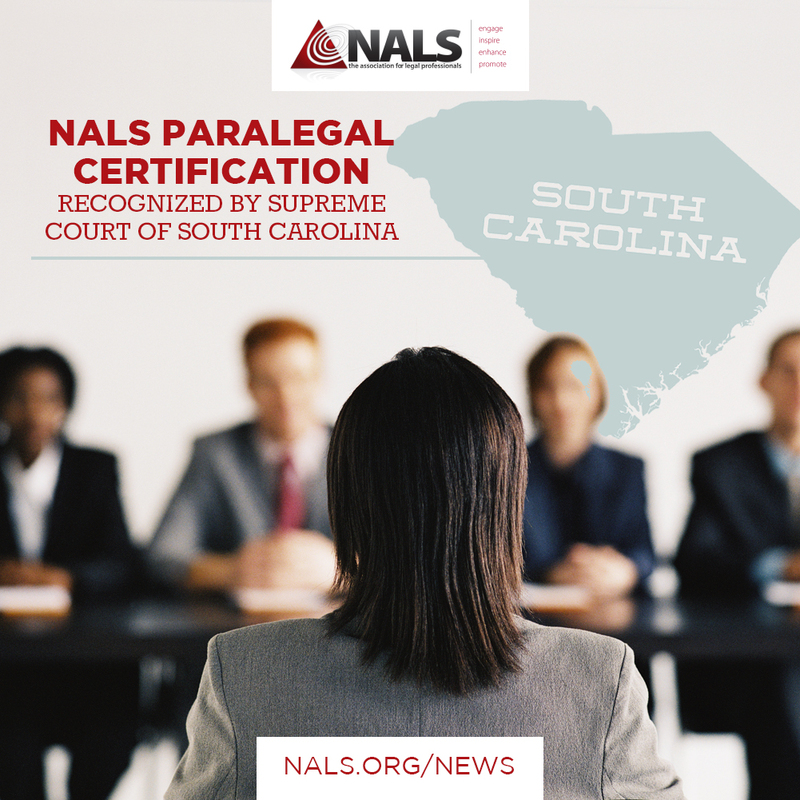 Certification of paralegals is now a reality in South Carolina and NALS is a part of that. This action will have a ripple effect across the states that certify paralegals and NALS members may still have to commit and work to be included in their states. The Winter @Law will feature an article by Karen Cummins on how this change for paralegals took place in South Carolina and what it means for the paralegal profession. A very special thanks to our Industry Certification Task Force Chair Tara Jean Brown, PP, PLS, and committee members; NALS Director Carl Morrison, PP-SC, RP, AACP; and NALS members Karen M. Cummins, MPS, CPP, PLS, and Jamie Early, PP PLS-SC, for their efforts to make this happen. That is wonderful news! Thank you for working hard to make this happen! Thank you, Karen Cummins, PP, PLS, M.P.S., for your hard and dedicated work on this project!